ALL I want for Christmas is a new set of legs. This is five year old Mia Wilkinson's wish. Like all preschoolers Mia is excited about Christmas. Just a mention that Santa is coming soon and her face lights up the room. That's the thing about Mia, she has a cheeky smile that would melt a thousand hearts a big grin that belies the horrors she has lived in the past year. A year that saw the healthy and energetic girl fall ill with the flu and within days end up on life support with deadly sepsis. Her heart stopped and a team of medics brought her back from the grip of death. She lost her arms and not long after her legs. 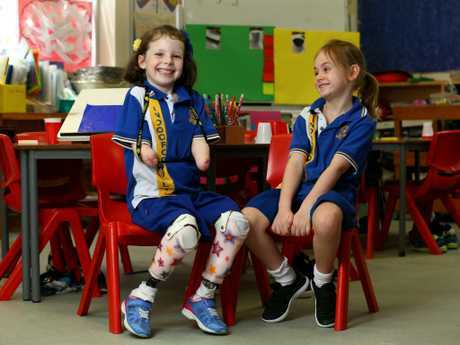 Mia is now very new to the challenges of life as a quadruple amputee but this amazing little girl is an inspiration to Queenslanders of all ages. She is resilient and determined, the characteristics that made her hang on so tightly to life. She is already writing like any other preppie, can colour in between the lines, loves swimming and climbing. 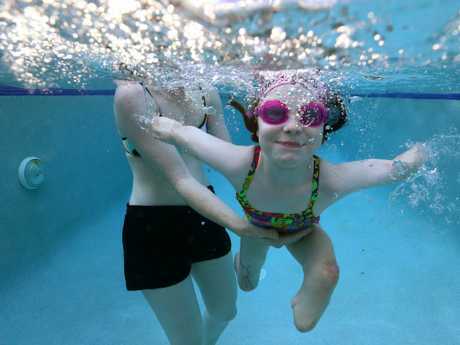 "She just wants to be like the other kids and that is what we want for her," her mum Amy said. Putting their own trauma to the side, the Wilkinson family wraps this little ray of sunshine in endless love. 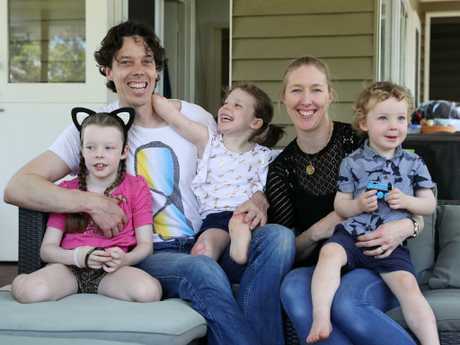 There is mum Amy, 39, a stay at home mum, dad Peter, 40, an IT specialist, big sister Ellie, 7 and little brother Max, 2. Mia was supplied with a set of hospital legs in July this year, her first pair following the amputation of her legs in January. Like all little kids she is growing at a rapid rate and within just four months has outgrown them. They are uncomfortable and she hates putting them on. 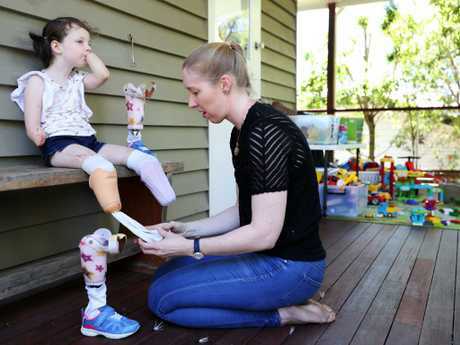 "Sadly, buying Mia a new pair of legs is not just like buying a child a new pair of shoes that they have outgrown. A set of legs will cost around $30,000. 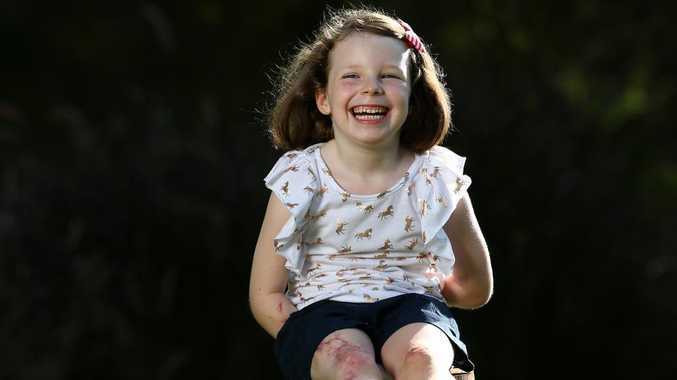 Mia will continue to grow and keeping her out of her wheelchair is going to cost a lot of money over the years," Mia's mum Amy said. The NDIS are working on a plan for the Wilkinsons but they have been told it will take months to be completed and there will be no funding in the interim. "They have informed us they will provide funding for what is "reasonable and necessary" Amy said. 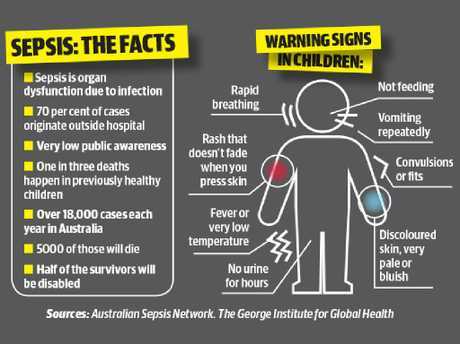 The sneaky nature of sepsis, a serious complication of infection, takes the life of 5000 Australians annually. "We had never heard of sepsis but it has turned our lives upside down. Sepsis has flu-like symptoms making it difficult to detect. Time is critical and antibiotics and fluids need to be administered early," Amy said. 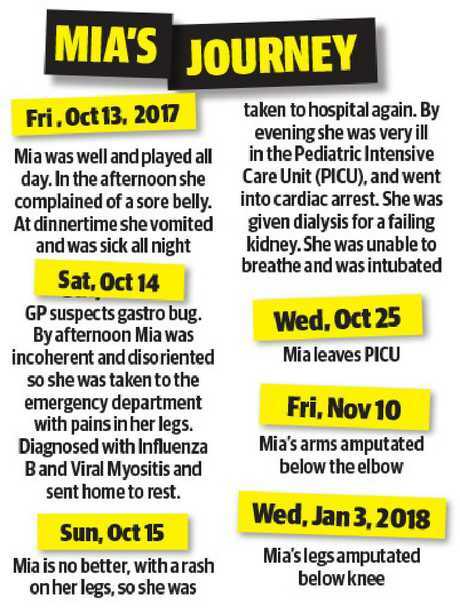 Sepsis was Mia's body's immune response to Influenza A, Influenza B, Respiratory Syncytial Virus and an invasive Streptococcal A bacterial infection. "It all came out of nowhere. On the Friday Mia was perfectly fine playing with her cousins. and by Sunday the light purple rash appeared on her legs. We took her to hospital and within hours she was in intensive care fighting for her life," mum said. "As doctors put a tube down her throat to help her breathe her heart stopped and a team of medics rushed in to try to revive her. That was a profound moment that replays in my head. I let out a scream to my husband Peter and shouted "We are losing her". We held each other and cried and I can't put into words the relief when they found a heartbeat," she said. The distraught parents could do nothing as they watched an insidious, dark purple discolouration creep up their child's arms and legs. They watched and waited in a fog of fear. "On the second or third day, a nurse pointed to the display on the machine that was doing Mia's breathing. Every minute or so a little picture of lungs would flash up. The nurse explained that this happened whenever Mia attempted to breathe on her own. We can't describe the relief at seeing that icon as we began to believe that Mia would come through," she said. On October 21 after six days on life support Mia started breathing on her own and talking a little. The dark rash was hard to ignore but there was tremendous hope. 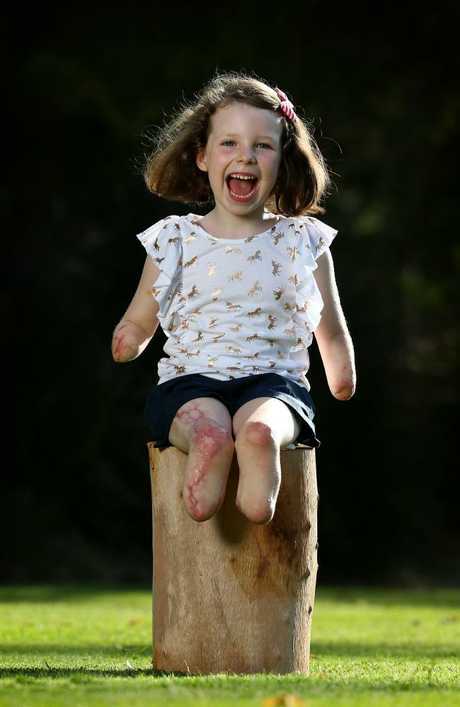 "We had so much hope that she wouldn't lose too much of her hands and feet. 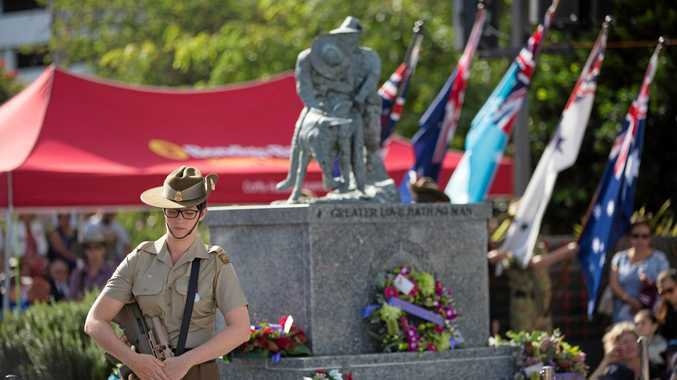 All we could do was be with her, be her advocates, surround her with family and love her," mum said. Mia's prep teacher Cassandra Fehervary is working with Amy to build her independence. "Mia is bubbly, positive, determined, persistent and resilient. She has her highs and lows and we are trying to teach her to try things for herself. The kids show her great compassion and empathy," she said. Mia's best friend is another Mia - Mia McCosker is always by her side. They giggle and share secrets like all other five year olds. The memories of the past year are like open wounds, raw and painful but the Wilkinsons have big hopes for a big life for their little Mia.